USAG Bavaria volunteer Victoria Thompson, second from right, helps serve military families and Soldiers at the 2016 Red Cross Zombie Apocalypse on Tower Barracks. When we landed in Germany, the air was cold and snow was falling softly to the ground, painting a beautiful winter wonderland. Like most, we were placed in a hotel and given a few weeks to find somewhere to live. Not knowing anyone and having to find a new home, all while being seven and a half months pregnant, wore me down. I tried to stay positive, but without friends, family, or even a car, there was no way for me to get to my doctor appointments. We got lucky and found a nice house for rent with a wonderful land lady and soon our possessions and car arrived from the States. I spent the next few weeks drowning in boxes trying to get everything ready before our little one came. Thankfully, we got the house set up just in time, as our son came early. This is when I realized how hard things could be. We were alone in a foreign country with a newborn. We did not live on post surrounded by other military families. There were no family or friends to help us adjust to our new roles as parents. The village that was supposed to help us raise our child was an ocean away. I was learning that there are a lot of things no one tells you about having a baby. They don’t tell you that love doesn’t always come instantly when you have a child. Or that you will continue to look pregnant for a while after your baby is born. My expectations were being crushed under a flood of reality. When our little man turned six months old, I knew that I needed a change of pace from the constant baby talk. I felt like I was starting to crack. Joining the ACS Newborn Group was the only thing that kept me sane at the time. I never realized how important adult interaction is in daily life. I also tried to get a job, but, with so many spouses seeking work and so few positions on post, nothing ever came of my efforts. Since I was 14, I’ve always had a job, and these constant rejections were the last straw. I fell back into depression, lacking the desire to cook, clean or even get dressed. I took care of my son and let everything else descend into chaos. After some time, I tried volunteering at a few places on post. I still applied to jobs, when they became available. I met other spouses in the same boat as me, looking for work and volunteering to help keep their resumes current. I started my volunteer experience with the Red Cross and met a few women volunteering at the clinic because no paid positions were available for nurses. Knowing that nurses couldn’t find positions made me feel better about my predicament with the jobs on post. That’s when I decided to put all my efforts into volunteering. It took a while to find a good fit for me, but after several tries I found a few organizations that I really enjoy. Volunteering has been my saving grace as a military wife. I found new friends with common interests and started building my new “village.” I have always believed that volunteering is a great way to give back to the community, but now I also see it as a great way to make connections, build relationships and develop professionally. Whether you are trying to make friends, build your resume or help your community, volunteering is a great place to start. Volunteering has enabled me to find fulfillment again. If you are considering becoming an active volunteer here at USAG Bavaria, contact the Volunteer Coordinator at ACS at DSN 476-2650, CIV 09662-83-2650. 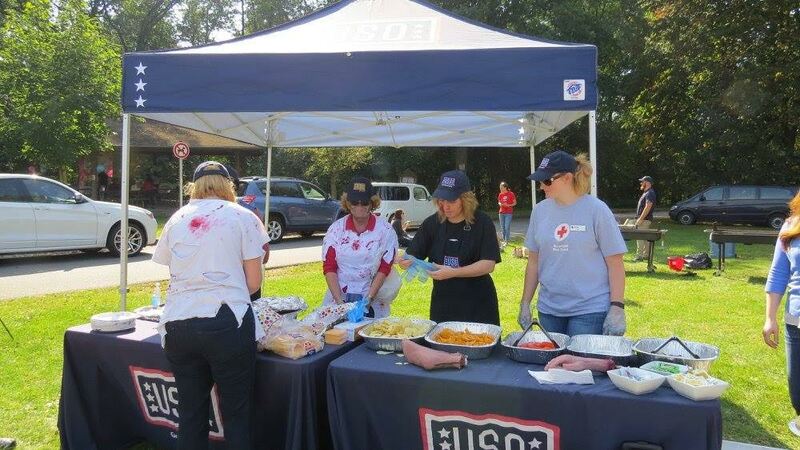 You can also volunteer at partner organizations like the American Red Cross and USO. Volunteer opportunities are all over post. Don’t be afraid to ask.